Reading and Writing and ‘Rhythmatic– Math Art! A special treat. My friend Greg gives us a report on some of the beautiful artwork inspired by mathematics. I am Greg Coxson. I have been a friend of Mary G. (the flesh-and-blood crafty lawyer), for decades now. I would like to report on an exciting development that you may find interesting, maybe even life-changing. The past several years have seen a growing exploration of intersections between Mathematics and the Arts. Here “the Arts” is meant in its full flowering, including not just two dimensional paintings, but also sculpture, music, dance, fabric and bead art, poetry and beyond). There are two notable fun and inspiring gatherings of this burgeoning Math-Art community each year. One is the Bridges conference which takes place in July each year in a different city somewhere on the globe (in 2014 it will be in Seoul, South Korea). 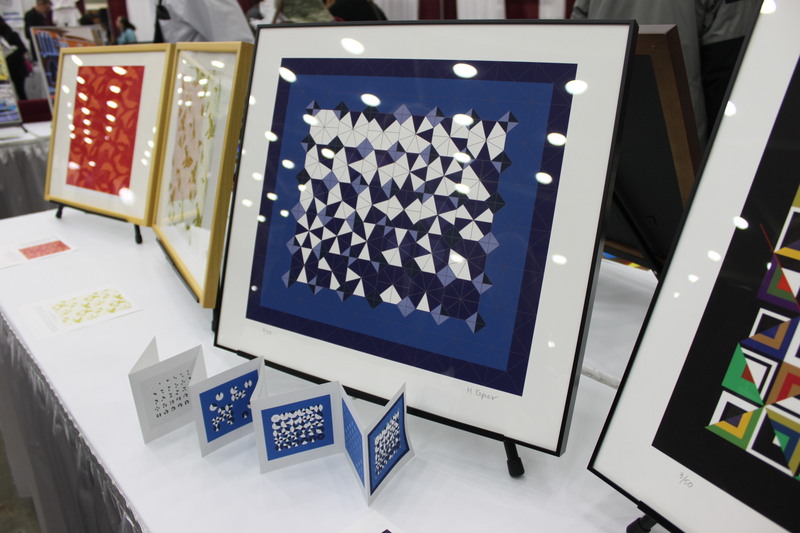 The second is the judged mathematical art exhibit at the Joint Mathematics Meeting (JMM), which takes place in January in some American city (usually in the south for obvious reasons). In the last several years, I have become more and more interested in these developments. Frankly, I now find what these folks do to be quite amazing. For one thing, the artwork needs to be appealing and interesting. Also, the artist needs to consider the materials and how to create the artwork from them. Furthermore, and I am not sure this is where it ends, the piece has to have some serious mathematics behind it. For some of the artworks at the Bridges conference, for instance, the artist even writes a scholarly journal-worthy article to explain the background of the piece. This year, the JMM took place at the Inner Harbor in Baltimore, To take advantage of this remarkable opportunity, the Crafty Lawyer dispatched me to report on the goings-on. These conferences tend to be times of great busy-ness for me. Still, I was able to find the time to stop by the show. I quickly found the newest offerings by Margaret Kepner, a Washington-based print artist. Margaret does very clean, sharp, colorful works that are at the same time appealing and based on very sophisticated mathematical methods and concepts. 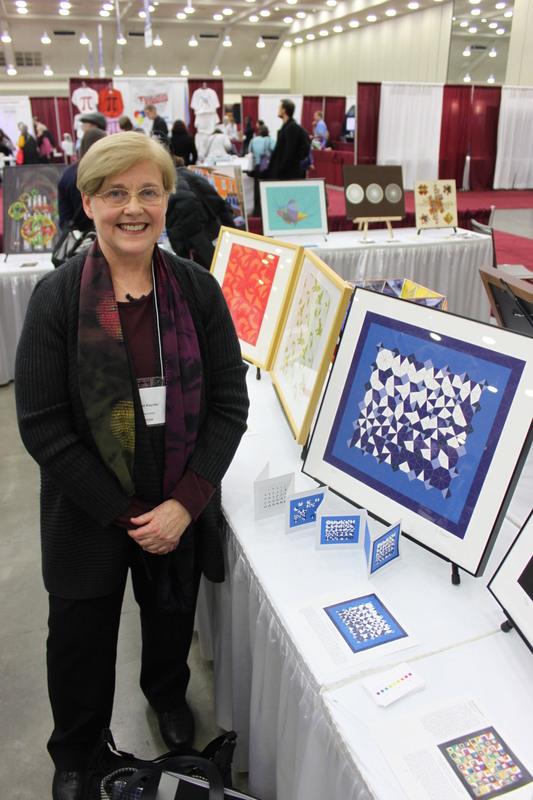 Margaret actually won first prize in the judging in 2011 for a print based on a magic square where the magic takes several forms, which Margaret highlighted using both pattern and color. While Margaret’s mathematically-based prints are wonderful enough, I am going to share an inside secret. Her custom-designed cards are even more amazing. For years she has been doing cards for events in her own family. These are based on mathematics too, and they celebrate birthdays, anniversaries and holidays in creative, fresh ways. If you get a chance to talk with Margaret, it is really a treat to see and learn about these cards. Margaret had two pieces in the JMM mathematical art exhibit this year. The one I chose to feature is pleasantly relevant to the Crafty Lawyer. This piece is a print rendered in white and various shades of blue. The first pattern that strikes the eye is a 6 x 5 array of 30 hexagonal or “hexagon-like” shapes. Each of these hexagonal shapes is divided into eight triangles (or near-triangular wedges) combined in a pie-shaped arrangement. Each of the eight triangles represents a separate bead in an eight-bead necklace; its color is one of two colors for that bead. So one of these 30 pies stands for one way to color an eight-beaded necklace where each bead can have one of two colors. You are probably now well ahead of me in asking, “Why only 30? Aren’t there 256 ways to color eight beads using two colors?” Well, you would be right, of course. However, after you consider symmetries, it comes down to 30 “distinct’” possibilities. One pattern can be rotated to give as many as eight that are essentially the same pattern. The set of 30 provides a minimal yet full set of representatives for the 256 possibilities without tiring the viewer with unnecessary redundancies. As with many works by Margaret and other mathematical artists, it does not end there. She has also worked into the piece the 6 ways to color a four-beaded necklace using two colors. These are depicted as different colorings of four-section diamonds. Note that the 6×5 array has 36 corners. These 36 corners are arrayed in 6 columns. Kepner has placed the six possibilities down each of these columns. Then, from one column to the next, she cyclically shifts the ordering of these diamonds by a single shift. Okay, that is probably already more than enough mathematics. Perhaps, though, you join me in feeling a bit of wonder at how Kepner forms a piece that appeals even without inspecting it for the mathematical underpinnings. I want to thank the Crafty Lawyer for this arduous and risky assignment. Despite the stress and the late nights, I am available for similar reporting at Bridges in Seoul this summer, or JMM San Antonio next January.